Single-cell RNA-seq has the potential to facilitate isoform quantification as the confounding factor of a mixed population of cells is eliminated. However, best practice for using existing quantification methods has not been established. We carry out a benchmark for five popular isoform quantification tools. Performance is generally good for simulated data based on SMARTer and SMART-seq2 data. The reduction in performance compared with bulk RNA-seq is small. An important biological insight comes from our analysis of real data which shows that genes that express two isoforms in bulk RNA-seq predominantly express one or neither isoform in individual cells. RNA-seq has transformed genomics by making it easy and relatively inexpensive to obtain genome-wide, quantitative measurements of the transcriptome. To be able to take full advantage of this data, however, it is critical to have robust and accurate computational methods for quantifying transcript abundances. Isoform quantification is considered a hard problem [1–3], and the main reason why it is so challenging for mammals is because many genes have multiple isoforms which are highly similar in terms of sequence and exon structure. Because of this overlap, many reads from RNA-seq experiments cannot be uniquely assigned. Although a number of strategies have been developed to attempt to quantify isoforms [4–12], the problem of how to deal with reads which map to more than one isoform has not been fully solved [13, 14]. Although bulk RNA-seq data of cells indicate the expression of multiple isoforms, scRNA-seq of the same cells show evidence for a single or a small number of isoforms per gene [15–18]. This is potentially beneficial, as it suggests that by performing isoform quantification using single-cell RNA-seq (scRNA-seq) data rather than bulk RNA-seq data, the problem could be simplified due to a reduced number of multi-mapping reads. As well as allowing basic biological questions on cellular heterogeneity to be investigated, isoform quantification using scRNA-seq could have applications in fields such as cancer, developmental biology, alternative splicing, and neurobiology. Despite the intrinsic benefits of single-cell resolution, to date most scRNA-seq research has focused on gene-level quantification and analysis . This partly reflects the novelty of single-cell RNA sequencing technologies, and best practices for performing isoform quantification using single-cell data have yet to be established. Numerous tools to perform isoform quantification are available [4–12], but most of these tools were designed for bulk RNA-seq analysis and it is not clear whether it would be appropriate to apply these tools to single-cell analysis. For other tasks, e.g., normalization, it has been shown that applying methods designed for bulk RNA-seq to scRNA-seq can give misleading results . It has not yet been established whether isoform quantification methods designed for bulk RNA-seq are accurate for single-cell data. In addition to software concerns, there are experimental and technical issues which could impact on isoform quantification in single cells. A wide range of library preparation protocols have been developed for scRNA-seq [21–29], some of which are likely to be more appropriate for isoform quantification than others. For example, one way in which library preparation protocols could differ in their suitability for isoform quantification is in their degree of gene length bias, which has been shown to be greater for full-length transcript protocols compared with UMI-based protocols . An understanding of which library preparation protocols generate data suitable for isoform quantification and which library preparation protocols do not would allow researchers to better design experiments to suit their needs. Due to the low amount of starting material, scRNA-seq data has greater variability and a greater number of transcripts for which zero reads are detected, i.e., dropouts, relative to bulk RNA-seq data . It is known that while some of this variation is biological in origin, a substantial proportion is technical [17, 32, 33]. Dropouts, defined as events in which reads mapping to a gene or isoform are detected in some cells but not others, are highly prevalent in scRNA-seq . The impact of dropouts and other technical noise on isoform quantification tools is not known, and different strategies than the ones that were used for bulk RNA-seq may be required. To assess isoform quantification for scRNA-seq, we present a simulation-based benchmarking study using data generated from three different scRNA-seq projects. While benchmarking studies have been performed previously for bulk RNA-seq [13, 14], to the best of our knowledge, this is the first benchmark of isoform quantification performed for scRNA-seq. We evaluated the overall accuracy of different isoform quantification methods when applied to scRNASeq, and we also specifically studied the impact of library preparation protocol and dropouts. We tested five popular isoform quantification tools on simulated scRNA-seq data based on three publicly available scRNA-seq datasets produced using different library preparation protocols and cell types. With the exception of eXpress, performance was generally good for simulated data based on SMARTer and SMART-seq2  data. Compared to bulk RNA-seq, isoform quantification was only slightly worse for SMARTer and SMART-seq2 data, suggesting that it is appropriate to use these methods for full-transcript single-cell data. The first dataset considered in this benchmark consisted of 96 mouse quiescent B lymphocytes collected as part of the BLUEPRINT epigenome project  (GEO accession code GSE94676). The SMARTer library preparation protocol was used to collect this dataset, which has been shown to have a degree of 3′ coverage bias . On average, just over 2.7 million reads had been sequenced per B lymphocyte. To perform the benchmark, simulated data was generated from the selected cells using two simulation methods. The first simulation method used was RSEM  (see Methods for details). RSEM is an isoform quantification tool which uses a generative model and expectation maximization to estimate isoform expression. In addition, RSEM is capable of simulating reads using its generative model and input values for the latent variables in the model, which can be estimated during isoform quantification. An important reason for selecting RSEM to perform the simulations is that during the simulation process, RSEM records where each simulated read originated in the transcriptome. Consequently, it is known how highly expressed each isoform is in the simulated data. This will be referred to as the “ground truth.” Knowing the ground truth allows us to benchmark expression estimates from isoform quantification tools using the simulated data. The RSEM- and Splatter- and Polyester-simulated reads data was then given as input to RSEM, eXpress , Kallisto, Salmon , and Sailfish . The isoform quantification tools provide two useful pieces of information for each isoform—whether it is expressed and its expression level. To quantify the ability of each method to detect the presence of an isoform, the precision and recall were calculated. In this context, the precision is the fraction of isoforms predicted to be expressed by each tool which are expressed in the ground truth. The recall is the fraction of isoforms expressed in the ground truth which are predicted to be expressed using the tool. For a single overall quality score, we used the F1 score, which is defined as the harmonic mean of precision and recall. Salmon can be run in three modes—an alignment-based mode, in which aligned reads are taken as input, or one of two alignment free modes (a quasi mode or an SMEM mode). The performance of all three modes was evaluated in this benchmark. For most isoform quantification tools, the mean F1 score was remarkably similar and in the range of 0.777–0.888. The exception was eXpress, which had a slightly higher recall but a much lower precision than other tools, and consequently had the lowest mean F1 score (between 0.463 and 0.492 depending on the simulation method) (Fig. 2a). The mean F1 scores, precisions, and recalls calculated for each of these tools were similar regardless of whether RSEM or Splatter and Polyester were used to generate the simulated data. The statistics were not dramatically altered when Polyester simulated reads using a 3′ coverage bias model compared to when Polyester simulated reads uniformly across transcript length. However, as the Polyester 3′ coverage bias model is not based on single-cell RNA-seq data, care needs to be taken when interpreting this result. In addition to determining whether an isoform is expressed, it is often of interest to estimate isoform abundance. To evaluate how well isoform quantification tools perform this task, two measures were considered—Spearman’s rho and the normalized root mean square error (NRMSE) (Fig. 2b, c). Spearman’s rho gives a measure of how monotonic the relationship between the ground truth expression and each tool’s expression estimates is, while the NRMSE gives a measure of the extent to which the relationship deviates from a one to one linear relationship (see Methods for details on how the NRMSE was calculated). Consistent with the results for isoform detection, mean Spearman’s rho was similar between isoform quantification tools and simulation methods and in the range 0.782–0.891. The exception was eXpress, which had much lower mean Spearman’s rho than the other tools with values from 0.550 to 0.574. eXpress also performed poorly relative to the other isoform quantification tools when considering the NRMSE. 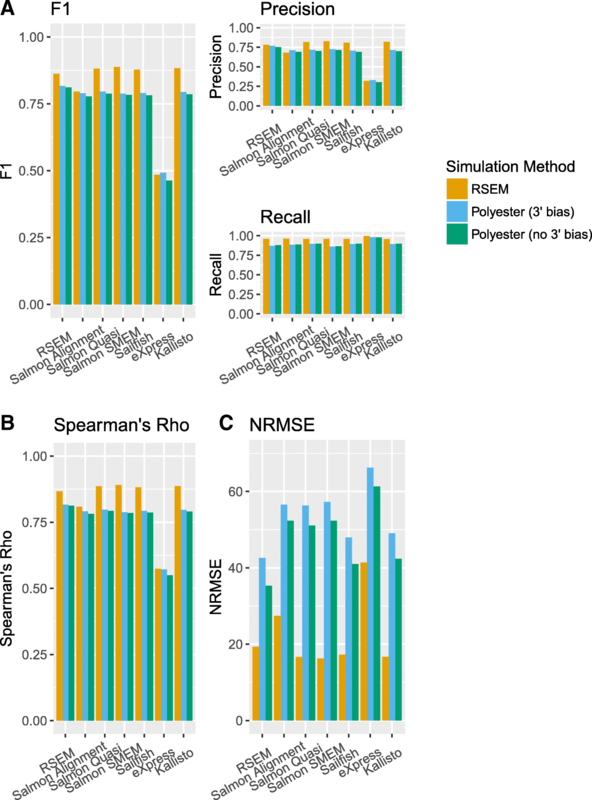 Interestingly, although the overall pattern of NRMSE results was similar for both simulation methods, the NRMSE was consistently far higher for the Splatter and Polyester simulations compared to the RSEM simulations. One possible explanation is that the difference in the NRMSE is due to a small number of outliers. However, this did not appear to be the case (see Additional file 1: Figure S6). Another explanation for the difference in the NRMSE could be that the differences are largely driven by differences in the ground truth expression distributions of the RSEM simulations compared to the Splatter and Polyester simulations. Since the NRMSE is proportional to the sum of squared differences between the ground truth and the isoform quantification tool’s expression estimates, it is plausible that it will be relatively rare for an unexpressed isoform to have an estimated expression other than zero, but relatively common for an expressed isoform to have an estimated expression that differs from the ground truth expression. We found that the distribution of ground truth expression values differs for each simulation method (see Additional file 1: Figure S7). Therefore, differences in the ground truth expression distributions seem to be the most likely explanation for the systematic difference in the NRMSE between simulation methods. The difference in the NRMSE between simulation methods was not the only aspect in which the simulation methods differed. A comparison of the simulated data with the real data was carried out using both a comparison tool included in Splatter and using CountsimQC , a package which facilitates comparison of simulated datasets. The RSEM-simulated data more closely resembled the real data than the Splatter and Polyester-simulated data by a number of metrics, including the sample-sample correlations, the mean-variance relationship, and the relationship between magnitude of expression and fraction of zeros (Additional file 1: Figure S8). In contrast, when comparing the simulation tools using gene-level statistics such as the distribution of mean expression, distribution of variance and percentage of zeros per gene, the resemblance between the Splatter/Polyester-simulated data and real data is much closer (Additional file 1: Figure S5). We suspect that these differences are because Splatter loses gene names during its simulations. When the Splatter counts matrix was used with Polyester to simulate reads data, we updated the row names to reflect the transcripts simulated by Polyester. Consequently, we would expect there to be little or no relationship between the expression of a given gene in real data and the corresponding Polyester/Splatter-simulated data. Indeed, we find that the correlation between ground truth isoform expression in the Splatter- and Polyester-simulated data and isoform expression estimates generated by running Kallisto on the real BLUEPRINT B lymphocyte data is very low (see Additional file 1: Figure S9). In contrast, the correlation between ground truth expression in the RSEM simulations and Kallisto expression estimates in the real data was much higher. The different transcriptional profile in the Splatter- and Polyester-simulated data compared with the real BLUEPRINT B lymphocyte data is a likely consequence of updating the Splatter gene names to reflect the transcriptome used in the Polyester simulations (Step 3 in Fig. 1). An additional potential issue with this step in our methodology is that factors which would normally impact on expression estimates, such as gene length, GC content, and secondary structure, are not considered during our simulation protocol. The relationships between these features and expression estimates in our simulated data are unlikely to match the real data. Based on these limitations and our findings above, we concluded that the RSEM simulations resembled the real data more closely than the Splatter and Polyester simulations. We suspect that this occurs due to the loss of gene labels during the Splatter simulations and subsequent reassignment during the Polyester simulations, leading to a radically different transcriptional profile in the Splatter/Polyester-simulated data. Consequently, for the rest of this paper, all data was simulated using RSEM. Despite the differences between the RSEM and Splatter and Polyester simulations, the results of the benchmark were remarkably consistent. This suggests that the findings in this benchmark are robust to some differences between datasets, including dramatic changes in the transcriptional profile. To test whether the results of our benchmark were robust across different datasets, we next considered a mouse embryonic stem cell (mESC) dataset published by Kolodziejczyk et al. . On average, over 7 million reads were sequenced per cell in this dataset, considerably more than in the BLUEPRINT dataset. Intuitively, it seems likely that sequencing more reads per cell should lead to improved isoform quantification. However, sequencing more reads per cell is expensive and may come at the cost of being unable to sequence as many cells. Therefore, determining whether sequencing a higher number of reads per cell improves isoform quantification is likely to be of interest to many researchers. From the Kolodziejczyk et al. dataset, 271 mESCs grown in standard 2i media + LIF which passed quality control were used for the benchmark (see Methods). This dataset should therefore give a good indication of the performance of isoform quantification tools when there are a high number of reads per cell but a relatively low number of cells. In addition, this dataset has uniform coverage of transcripts, as it was sequenced using the SMART-seq2 protocol . To perform the benchmark, simulated data was generated as described previously from the selected cells from Kolodziejczyk et al. (see Methods for details). The simulated reads data were then given as input to RSEM, eXpress, Kallisto, Salmon, and Sailfish. The highest F1 score was achieved by Salmon run in SMEM mode (0.889), with RSEM, Salmon run in quasi mode, Sailfish, and Kallisto also achieving mean F1 scores greater than 0.85 (Fig. 3a). Again, eXpress performed most poorly by a substantial margin, with a mean F1 score of 0.548, and again, eXpress had a higher mean recall (0.997) but a much lower mean precision (0.378) than other tools. It seems likely that eXpress’s low precision is due to it being too liberal when calling isoforms as expressed. The average number of isoforms called as expressed per cell was twice as high for eXpress, which called an average of 41,372 isoforms as expressed per cell, as for any other tool. The other isoform quantification tools had high mean recalls between 0.956 and 0.960. In contrast, the highest mean precision was just 0.831 by Salmon run in SMEM mode, which means that nearly one in six isoforms predicted to be expressed by the best performing tool were not actually expressed. The high recall values achieved by all the tools considered here indicate that the vast majority of isoforms expressed in the simulated data are detected, with the lower precision values being a greater cause for concern. Knowing that an isoform is not expressed can be as important as knowing that an isoform is expressed, especially if that isoform is being used as a marker, for example in clustering analysis. A strategy for improving the detection ability as quantified by the F1 score of isoform quantification tools for scRNA-seq could be to make future tools more conservative when calling isoforms as expressed. The highest mean value of Spearman’s rho was obtained by Salmon run in SMEM mode (0.896), with Salmon run in quasi mode, Kallisto, RSEM, and Sailfish obtaining similar values. The lowest mean value of the NRMSE was also obtained by Salmon run in SMEM mode (19.5), with Salmon run in quasi mode, Kallisto, RSEM, and Sailfish obtaining similar values. Again, of the tools considered, eXpress performed most poorly by a substantial margin. We find that the performance of existing isoform quantification tools is generally good when run on simulated data based on SMART-seq2 and SMARTer scRNA-seq data. We next consider the performance of isoform quantification tools when scRNA-seq data is used compared with bulk RNA-seq data. Although previous benchmarks of isoform quantification have been performed using bulk RNA-seq data [13, 14], a direct comparison with our benchmark is challenging due to differences in the experimental approaches taken. Consequently, it is not possible to say whether any perceived change in the performance of a given tool in our benchmark compared with a bulk RNA-seq benchmark is due to differences in how the benchmark was performed, differences in which statistics were collected, or due to a genuine difference in performance on bulk and single-cell data. To gain further insights regarding the performance of the tools, we made use of the bulk RNA-seq data generated for the BLUEPRINT B lymphocytes and Kolodziejczyk et al. standard 2i media + LIF mESCs. We used RSEM to simulate the bulk RNA-seq data and collected the same performance statistics for our bulk RNA-seq benchmark as in our scRNA-seq benchmark. As the data used in our bulk and scRNA-seq benchmark came from the same source, the same method was used to generate the simulated bulk and scRNA-seq data, and the same performance statistics were collected in both benchmarks, we were able to carry out a meaningful comparison of isoform quantification tool performance on bulk and scRNA-seq data. We find that all isoform quantification tools performed well on the simulated bulk data, but since most methods also performed well on single-cell data, the improvement was generally small (Fig. 4 and Additional file 1: Figure S13). In particular, there is very little difference in the recall for bulk and scRNA-seq, for which performance seems to be close to optimal. Interestingly, eXpress performs far better on bulk RNA-seq compared with scRNA-seq. Since eXpress appears to be overly liberal in calling isoforms as expressed, one explanation for the better performance of eXpress on bulk RNA-seq is that more isoforms have non-zero expression in bulk (Additional file 1: Figure S14). Consequently, there are fewer unexpressed isoforms for eXpress to incorrectly call as expressed. While it is of interest to determine which isoform quantification tools perform best overall when run on scRNA-seq data, it is important to recognize that such an analysis may hide a lot of detail. For example, scRNA-seq data commonly contains a high number of dropouts , and one question of interest is whether the performance of isoform quantification tools differs between isoforms with a high number of dropouts and isoforms with few or no dropouts. To address the impact of dropouts on performance, Spearman’s rho and the NRMSE were calculated when isoforms with zero expression in more than a specific fraction of cells were removed from the analysis. Interestingly, applying increasingly stringent thresholds to remove isoforms with a high number of dropouts led to an increase in the value of Spearman’s rho in both the Kolodziejczyk et al. and BLUEPRINT simulations (Fig. 5a). For isoforms which had dropouts in less than 20% of cells, the value of Spearman’s rho became very high for Sailfish, Salmon, Kallisto, and RSEM (in the range of 0.992–0.996 for the BLUEPRINT simulations, and 0.977–0.989 for the Kolodziejczyk et al. simulations). This indicates that for isoforms with very few dropouts, isoform quantification tools are extremely good at ordering their relative expression correctly. Removing isoforms with a high number of dropouts had a more variable effect on the NRMSE. Due to the inverse relationship between magnitude of expression and number of dropouts  in both the real and simulated data (Fig. 5b), one explanation for the increase in Spearman’s rho is that lowly expressed isoforms are more likely to have a high number of dropouts and are also more likely to be mis-ordered with respect to the ground truth. However, because they are lowly expressed, removing them has a relatively small effect on the NRMSE. To determine whether individual cells express all or only some of the isoforms seen in a population of cells, we consider genes which have two isoforms, both of which are expressed in the BLUEPRINT B lymphocyte or in the Kolodziejczyk et al. ES cell bulk RNA-seq data. We then determine how many isoforms are expressed from these genes in the corresponding scRNA-seq data. Kallisto was used to perform isoform quantification for the bulk and single-cell data as it performed well in both our bulk and single-cell benchmarks. For genes which express two isoforms in bulk RNA-seq data, we first consider if zero, one, or two isoforms are detected in single cells. For most genes which express two isoforms in the bulk RNA-seq, neither isoform is expressed in most cells in the scRNA-seq (Fig. 6a). It is more common in cells which do express the gene to express one rather than two isoforms. To investigate this further, we consider the percentage of cells which express both isoforms expressed in the bulk RNA-seq. We find that for the majority of genes, no or very few cells express both isoforms seen in the bulk RNA-seq; however, for a minority of genes in both the BLUEPRINT B lymphocytes and Kolodziejczyk et al. ES cells, a high percentage of cells express both isoforms (Fig. 6b). Interestingly, more genes express both isoforms in the Kolodziejczyk et al. ES cells compared to the BLUEPRINT B lymphocytes. This may partly reflect the higher number of cells and the higher number of reads per cell in the Kolodziejczyk et al. ES cells, possibly enabling better detection of lowly and/or infrequently expressed isoforms. In addition, the globally elevated transcription rates in ES cells relative to other cell types might lead us to expect that expression of multiple isoforms from a single gene would be more common in ES cells . Finally, we ask whether more highly expressed genes are more likely to express multiple isoforms. 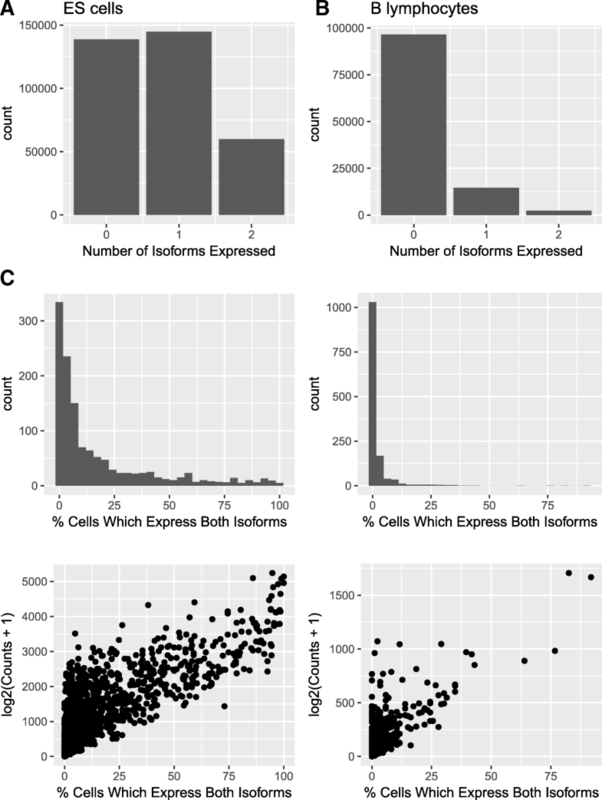 We find a positive correlation between gene expression and the percentage of cells which express both isoforms (Fig. 6c), indicating that more highly expressed genes are more likely to express both isoforms in individual cells. To date, scRNA-seq studies have mainly focused on gene-level quantification . This has partly been due to uncertainty over how best to perform isoform quantification in scRNA-seq. In addition, there has been uncertainty over whether the results obtained would be meaningful due to the low read coverage compared with bulk RNA-seq. 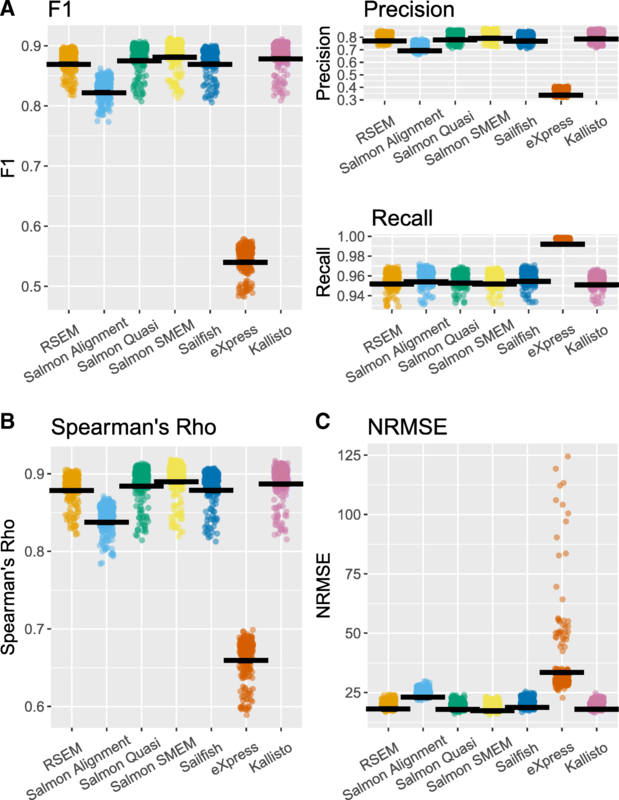 Our simulation-based analyses have demonstrated that Kallisto, Salmon, Sailfish, and RSEM can accurately detect and quantify isoforms in scRNA-seq to nearly the same accuracy as bulk RNA-seq data. A limitation of using simulations to benchmark isoform quantification is that simulated data will never fully recapture all of the features of real data. However, to the best of our knowledge it is currently impossible to obtain the ground truth for real scRNA-seq data, meaning a simulation-based approach is the only way to evaluate the performance of isoform quantification tools. In this study, we exclusively consider full-length scRNA-seq protocols for two reasons. First, it is almost certainly the case that full-length protocols will provide the most accurate isoform quantification, as protocols with little or no coverage bias should have an improved ability to distinguish isoforms which only differ at one end. Second, droplet-based protocols such as 10X and Drop-seq rely on cell barcodes and UMIs in their quantification [23, 43]. One limitation is that the tools evaluated in this benchmark provide little or no support for performing isoform quantification using this sort of data. Furthermore, there are currently no tools which simulate droplet-based reads data and record how highly expressed isoforms are in the simulated data (the “ground truth”), and without such a tool, it is not possible to benchmark isoform quantification methods using a simulation-based approach. At present, we do not recommend performing isoform quantification using droplet-based data, as the accuracy of performing such quantification has not been evaluated and current tools are not well designed for such an application. Given the growing popularity of droplet-based sequencing platforms, there is a clear need for an open source droplet-based reads simulator which could be used in future gene and isoform quantification benchmarks. In addition to benchmarking isoform quantification for scRNA-seq, we perform an equivalent benchmark for bulk RNA-seq. We find that the performance of most isoform quantification tools is slightly worse for scRNA-seq compared with bulk, but that the difference is small. The cost in performance using scRNA-seq compared with bulk RNA-seq for isoform quantification is therefore low. However, it should be noted that this benchmark has evaluated the ability of isoform quantification tools to correctly assign the reads present in a scRNA-seq experiment to the isoforms they originated from. As a major technical issue with scRNA-seq is failure to capture reads from a high proportion of expressed transcripts , it is likely that, in practice, many expressed isoforms will be missed by isoform quantification tools when run on scRNA-seq data due to a lack of evidence in the captured reads that the isoform was expressed. However, the extremely high recall of all the isoform quantification tools considered in this benchmark means that the overwhelming majority of isoforms from which reads are captured will be called as expressed. More problematic is the relatively low precision of isoform detection, as a consequence of which around one in six isoforms called as expressed in deeply sequenced scRNA-seq datasets will be false positives, even for the best performing tools. While our analysis has demonstrated that existing tools can accurately detect and quantify isoforms for scRNA-seq, no tool performed perfectly. The tools benchmarked here were designed for use with bulk RNA-seq, and the default settings which we used were tuned for this use. One explanation for the surprisingly poor performance of eXpress in single-cell RNA-seq compared with bulk RNA-seq could be that the default configuration is not appropriate for the much lower number of reads in single-cell RNA-seq experiments. If this is the case, the performance of eXpress could be improved by changing the parameters passed to eXpress when it is run on single-cell RNA-seq data. Thus, it is plausible that future tools designed to perform isoform quantification specifically for scRNA-seq could perform better. We found that the tools benchmarked in this study tended to have a higher recall than precision of isoform detection. Therefore, it is likely the performance of isoform quantification tools designed for scRNA-seq data could be improved by making the tools more conservative in calling isoforms as expressed relative to tools designed for use on bulk data. In addition, we found that Spearman’s rho increased when lowly expressed isoforms with a high number of dropouts were removed from the analysis. Thus, it is likely that attempts to incorporate the effects of single-cell-specific technical noise such as dropouts would improve the performance of isoform quantification tools on scRNA-seq. An open question for isoform quantification in scRNA-seq is whether incorporating information from unique molecular identifiers (UMIs) into isoform expression estimates could improve accuracy of quantification. While UMI information could reduce the effects of PCR amplification noise , UMI-based protocols tend to exhibit significant coverage bias, potentially making isoform quantification challenging . If UMI-based protocols could be combined with long read sequencing technologies, this problem could potentially be overcome. A number of previous studies have attempted to determine whether genes from which multiple isoforms are expressed in a population of cells are expressing all of these isoforms in individual cells [15–18]. However, a potential confounder in these studies is that the method used to detect isoforms has not been independently validated as accurate for scRNA-seq. We have demonstrated that Kallisto, Salmon, Sailfish, and RSEM can accurately detect isoforms for scRNA-seq with high precision and recall, and we used Kallisto to reproduce the finding of previous studies that it is unusual for single cells to express multiple isoforms from a single cell [15–18]. In addition to being of biological relevance, this finding is important from a bioinformatics perspective, as it suggests that the problem of isoform quantification is made simpler by using scRNA-seq. 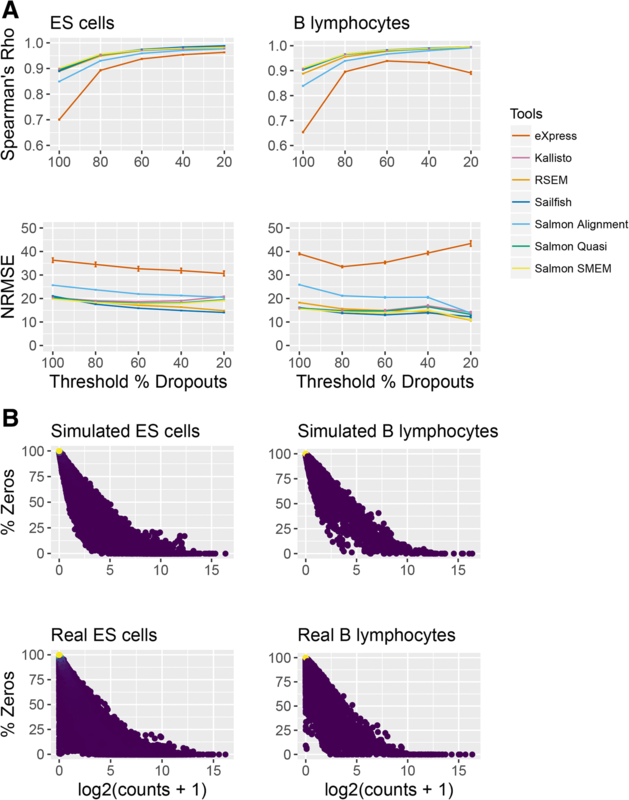 For high-quality simulated scRNA-seq datasets with a high number of reads/cell, RSEM, Kallisto, Salmon, and Sailfish can accurately detect and quantify isoform expression. Isoforms with a high number of dropouts appear to be relatively challenging to quantify, possibly because such isoforms are often lowly expressed. We find that genes which express two isoforms in bulk RNA-seq predominantly express only one (or neither) isoform in equivalent scRNA-seq. In our benchmark of bulk RNA-seq, we discover the performance of most isoform quantification tools is slightly worse for scRNA-seq compared with bulk, but that the difference is small. Taken together, our findings show that isoform quantification is possible with scRNA-seq for SMARTer and SMART-seq2 data. As single cells do not generally express all of the isoforms seen at the population level, scRNA-seq may eventually provide advantages over bulk RNA-seq for isoform quantification by essentially deconvoluting the problem of isoform quantification. Future isoform quantification tools designed explicitly for scRNA-seq could improve on the performance of existing tools by being more conservative in calling isoforms as expressed, and by explicitly modeling the technical noise inherent to scRNA-seq. The Ensembl release 89 genome and transcriptome with 92 spike-in sequences developed by the External RNA Control Consortium (ERCC) appended were used wherever genome files in FASTQ format and/or transcriptomes in GTF format were required [46, 47]. To perform simulation and isoform quantification, RSEM produces a reference which includes a reference transcriptome in FASTQ format. This reference transcriptome produced by RSEM was used for isoform quantification tools which required a reference transcriptome in FASTQ format as input (see Availability of data and materials for links to code). Sequencing adaptors were trimmed from the BLUEPRINT data using Cutadapt . Reads from each cell in these datasets were aligned to the Ensembl genome release 89 using STAR [46, 49]. RSeQC was used to collect alignment quality statistics for each cell . These statistics and the number of reads sequenced in each cell were used to remove low-quality cells from each dataset (see Additional file 1: Figures S1 & S2). In addition, Scater was used to plot the percentage of reads mapping to mitochondrial RNA and remove cells with greater than 10% of reads mapping to mitochondrial RNA  (see Additional file 1: Figures S1, S2, S3, S4, S10 and S11). Two simulation methods were used in this study. The first method used to simulate single-cell RNA-seq data was RSEM. RSEM is an isoform quantification tool which makes use of a generative model and an expectation maximization algorithm to perform isoform quantification . When performing isoform quantification, RSEM infers values for the latent variables in its generative model in addition to estimating isoform expression. To perform simulations, RSEM takes the inferred values of the latent variable and the expression estimates and uses them in its generative model to probabilistically simulate reads. As RSEM simulates reads, it counts where in the transcriptome each of the reads came from. RSEM thus simulates reads data for which it is known how highly expressed each isoform in the transcriptome is. For each cell in the Kolodziejczyk et al. and the BLUEPRINT datasets that passed quality control, one RSEM simulation was performed. Isoform quantification was performed on each cell and the isoform expression estimates and inferred estimates for RSEM’s latent variables were used to perform the simulation. Consequently, each RSEM-simulated cell used in this study was simulated using variables inferred from a real cell. The second simulation method was based on two tools, Splatter and Polyester. 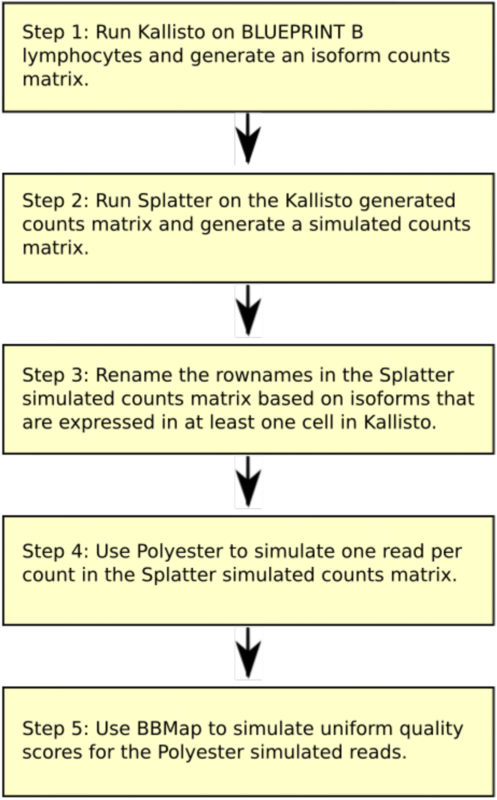 A flowchart showing the steps followed to generate the Splatter- and Polyester-simulated data is displayed in Fig. 1. Splatter is a simulation tool which takes an expression matrix of counts from a single-cell RNA-seq experiment as input and gives a simulated expression matrix of counts as output . The Splatter package in fact contains six simulation methods. To select which performed best, data was simulated using the Lun, Lun2, and Simple simulation methods. The Splat simulation method was discounted as it was unable to simulate large enough expression matrices to account for the larger number of isoforms compared with genes, and the scDD method was discounted as it simulates differential expression, and no differential expression was expected. The BASiCS method had not been implemented at the time when the simulations were performed. Based on Splatter-generated graphs, the lun2sim method, inspired by a simulation method developed by Lun & Marioni , was selected as it bore the closest resemblance to the real data (see Additional file 1: Figure S5). The lun2sim method was used to simulate a matrix of counts based on an expression matrix of counts from the BLUEPRINT B lymphocytes generated by Kallisto . The simulated expression matrix of counts was then given as input to Polyester, which simulated reads based on the lun2sim counts matrix. BBmap was used to simulate quality scores . Simulations were performed both using Polyester’s uniform coverage model and using Polyester’s 3′ coverage bias model. The Splatter counts matrix was converted to a matrix of TPM values, which were used as the “ground truth” for how highly expressed each isoform was in the Polyester-simulated reads data. Reads from each cell in the datasets simulated by RSEM based on the Kolodziejczyk et al. and BLUEPRINT datasets were aligned to the Ensembl genome release 89 using STAR. RSeQC was used to collect alignment quality statistics for each cell. The alignment quality statistics and the number of reads for each simulated cell were used to remove low-quality cells from each dataset (see Additional file 1: Figures S3 & S4). Scater was used to plot the percentage of reads mapping to mitochondrial RNA and remove cells with greater than 10% of reads mapping to mitochondrial RNA. Prior to isoform quantification, RSeQC was used to remove rRNA mapping reads from the BLUEPRINT B lymphocyte bulk RNA-seq data. where N is the number of isoforms that could have been simulated, S is the isoform expression estimates for the isoform quantification tool of interest, O is the ground truth expression estimates, and sd(O) is the sample standard deviation of the ground truth expression estimates. where Soriginal was the original value of the ground truth or the expression estimate. This transformation reduces the impact of a small number of highly expressed isoforms on the value of the NRMSE. We would like to thank Guillermo Parada, Vladimir Kiselev, and Tallulah Andrews for their advice on developing pipelines. We would additionally like to thank Vladimir Kiselev for his advice on managing results data. We would like to thank Sarah Teichmann and Aleksandra A. Kolodziejczyk for scientific advice and experimental support on the preparation of cells for the C1 system. We would like to thank Russell Hamilton, Sudhakaran Prabakaran, and Tallulah Andrews for their comments on the manuscript. We would like to thank to John Marioni from Cancer Research UK Cambridge Institute, for funding the sequencing runs of B and T lymphocytes scRNA-seq datasets. AFS and MSH were funded by BLUEPRINT (HEALTH-F5-2011-282510) and Wellcome Trust WT095606RR. MSH was also supported by a research grant CONICYT/FONDECYT/REGULAR No. 1171004. MH was supported by the core funding provided to the Wellcome Trust Sanger Institute by the Wellcome Trust. JW was supported by a BBSRC DTP studentship BB/M011194/1. The Kolodziejczyk et al. ES cell data was accessed from the ArrayExpress database (http://www.ebi.ac.uk/arrayexpress) using the accession number E-MTAB-2600, as described in the Kolodziejczyk et al. paper [40, 55]. The BLUEPRINT data was accessed under GEO accession number GSE94676 . The pipeline used to perform the BLUEPRINT benchmark can be found at https://github.com/AFS-lab/BLUEPRINT  under the GPL-3.0 license, zenodo link https://zenodo.org/record/1419195 . The pipeline used to perform the Kolodziejczyk et al. benchmark can be found at https://github.com/AFS-lab/ES_cell_pipeline  under the GPL-3.0 license, zenodo link https://zenodo.org/record/1419197 . The options and parameters passed to tools used to perform simulations and isoform quantification can be found at the above links. JW, AFS, and MH conceived the study and designed the experiments. JW carried out the experiments and wrote the manuscript. MSH generated the BLUEPRINT B and T lymphocytes bulk and scRNA-seq datasets. MH and AFS supervised the experiments. All authors reviewed and approved the manuscript. Zappia L, Phipson B, Oshlack A. Splatter: simulation of single-cell RNA sequencing data. BioRxiv. 2017. https://doi.org/10.1101/133173. Kim JK, Kolodziejczyk AA, Ilicic T, Illicic T, Teichmann SA, Marioni JC. E-MTAB-2600 - single cell mRNA -sequencing reveals cell-to-cell variation in three mouse ES cell culture conditions. ArrayExpress. E-MTAB-2600. https://www.ebi.ac.uk/arrayexpress/experiments/E-MTAB-2600/. Accessed 2018. Ferguson-Smith A, Adams D, Sjoberg M, Walker N. The BLUEPRINT Murine Lymphocyte Epigenome Reference Resource. GEO. GSE94676. https://www.ncbi.nlm.nih.gov/geo/query/acc.cgi. Accessed 2018. Westoby J, Herrera MS, Ferguson-Smith AC, Hemberg M. Simulation based benchmarking of isoform quantification in single-cell RNA-seq. Github repository scripts. (2018). https://github.com/AFS-lab/BLUEPRINT. Westoby J, Herrera MS, Ferguson-Smith AC, Hemberg M. Simulation based benchmarking of isoform quantification in single-cell RNA-seq. zenodo. (2018). https://zenodo.org/record/1419195#.W8nvzHtKjIU. Westoby J, Herrera MS, Ferguson-Smith AC, Hemberg M. Simulation based benchmarking of isoform quantification in single-cell RNA-seq. Github repository scripts. (2018). https://github.com/AFS-lab/ES_cell_pipeline. Westoby J, Herrera MS, Ferguson-Smith AC, Hemberg M. Simulation based benchmarking of isoform quantification in single-cell RNA-seq. zenodo. (2018). https://zenodo.org/record/1419197#.W8nvdHtKjIU.